Doug Stephens, executive director of the Ohio CASA program, offered his thanks and praise to 13 members of the community who were sworn in Tuesday to serve as volunteer court-appointed advocates for children. 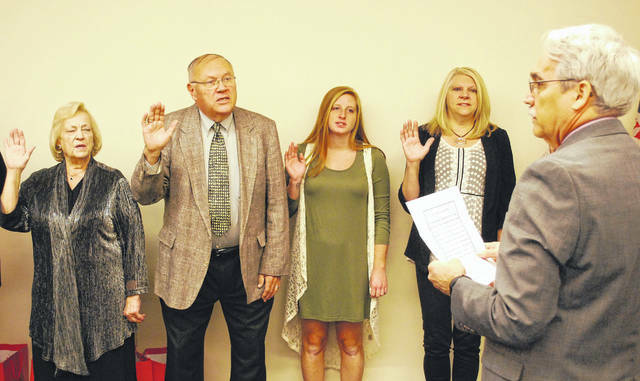 Allen County Juvenile Court Judge Glenn Derryberry issued the oath of office Tuesday to 13 new volunteer advocates of the CASA program — an acronym for Court Appointed Special Advocates for children. 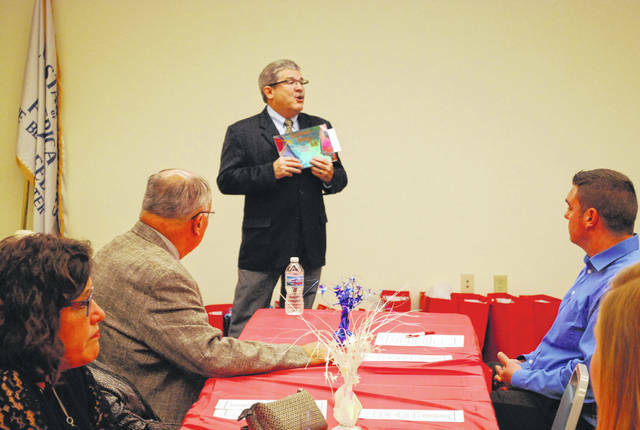 LIMA — CASA of Allen and Putnam Counties reached and exceeded a milestone Tuesday with the swearing in of 13 individuals who have been trained to work as court-appointed volunteer advocates for children. After only nine years of operation, CASA — an acronym for Court Appointed Special Advocates — now has more than 100 individuals providing a voice in court for the children of the community. That level of volunteerism is an accomplishment shared by only six other CASA programs in the state of Ohio. He said that during the past year the CASA program served nearly 9,500 abused and neglected children throughout Ohio. That work was accomplished with fewer than 2,500 volunteers statewide. The Allen/Putnam CASA office has advocated for nearly 900 children since its inception in 2009, and will reach approximately 275 children served in 2018, according to Tim Thurston, director of the local program. Volunteers undergo approximately 35 hours of training, meeting twice weekly for a month in classroom and courtroom settings. And even though the local program has exceeded the threshold of 100 volunteers, Thurston said more are always needed and welcome. Upon completion of training, volunteers “become an officer of the court; they meet with parents and family members, review medical records and meet with educators” as necessary to represent abused and neglected children in a courtroom setting. “We provide our recommendation to the court based on what is in the best interests of the child,” said Thurston. Taking the oath of office by Allen County Juvenile Court Judge Glenn Derryberry during Tuesday’s ceremony were Valeri Brokaw, Jeffrey Cleemput, Carrie Detwiler, Rebecca Diglia, Chris Fuerst, Ginger Gossard, Bridget Grothjam, Barbara King, Robert King, Lauren McLean, Melinda Rex, Patricia Wall and Barbara Wilson. Doug Stephens, executive director of the Ohio CASA program, extended his personal thanks to the newest volunteers. “I am so in awe of what you folks have committed to doing. This is hard, hard work,” he said. Thurston said local projections indicate there could be as many as 150 children for whom a CASA will not be assigned, based on a shortage of advocates. CASA holds pre-service trainings at least twice annually, he said. For more information on becoming a volunteer advocate, call 567-940-2272 or visit the program website at www.casaoflima.org.